The Gatetec Light has a traditional design widely used in the UK. The Light is perfect for smaller openings but can also be adapted for larger gate ways. The gate has intermediate and top rails. The bottom section on the gate has two uprights for every on in the top section – ideal for keeping pets inside the confines of the driveway. All uprights are mounted with fleur de lys railheads. The Gatetec Light can be made suitable for all types of automation however if you are using an above ground kit on a swing gate then the motors would be visible from the outside. 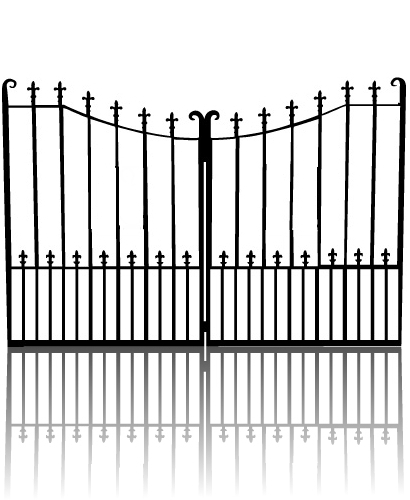 Learn more about types of automatic gates. Like all our Gatetec automatic gates Light will be made just for you the way you want it. This means we can change both the geometry and the style of the gate to suit your specification.